Every year I dreaded the first day of school. It was always the same thing. When the teacher called the roll and reached my name, I knew what to expect. Pat McClurg? Yes, ma’am, she’s my older sister. And yes, she is smart. In fact, she’s brilliant. Pat’s the smart one in the family, and she’s the athlete to boot. Me? I’m as dumb as a box of rocks. I still have a hard time telling my right hand from my left. Furthermore, I am the ditzy, clumsy one in the family. You know, I fall over walking across a bare floor. That’s why I take ballet with the hope of learning balance. But, I’d like to thank you for bringing my shortcomings to the classroom’s attention. All this hasn’t been pointed out since this time last year. But, that was the 1950s Texas Gulf Coast. Manners still counted. If I’d said anything like that, I would have been in the principal’s office in no time flat. Schoolteacher sassing was a McClurg household infraction to be dealt with in the severest of terms. Mother would have given me a big-time spanking. I probably would have gotten another from Daddy when he got home. Teacher sassing broke the Eleventh Commandment. In November 1957 of my sixth grade year, we moved. 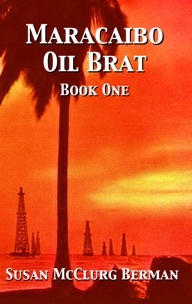 Daddy’s employer, Sun Oil Company, transferred us from Orange, Texas to Maracaibo, Venezuela. By that time, Pat was in college. She stayed in Texas. Going to an American school in Maracaibo? I was scared to death—all new teachers, and all new kids. My stomach hurt. The only good thing I could think of was that no one there knew my sister. In Maracaibo, I was on my own. Before I registered for class, Mother, Daddy and I drove by my future school several times. Twelve-foot-tall chain-link fences topped with four strands of rusty barbed wire surrounded the school grounds. How could anyone play in the schoolyard on the weekends if it was fenced off and the gates locked? Didn’t I need pencils and paper for school? How could I go to school without supplies? I wouldn’t know anyone in class to borrow from. What was the name of the school? Something about Bella Vista. There was so much to worry about. For the first day of school, I put on my new, blue cotton dress. Mother had bought it for me right before we left the States. This was unusual as store-bought clothes were too expensive for the McClurg budget. Typically, Mother sewed almost non-stop to keep up with my sister’s and my weed-like growth. We both followed Mother’s five feet ten inches height growth pattern instead of Daddy’s five feet seven. I needed more lightweight clothes for our transfer to a climate consistently hotter than east Texas Gulf coast. But, Mother hadn’t had time to sew during preparations for our move. Under my full skirt, I wore my best petticoat. I completed my ensemble with thin, white socks and my newest pair of white flats. I pulled my long hair back into a slick, tight ponytail high on top of my head. My blue barrettes clipped my blonde hair down smooth. I stared in the mirror and tried to imagine how the kids would see me. I shrugged my shoulders and headed for the car. Daddy drove Mother and me the few blocks to the school. I wanted to shrivel up into nothingness in the backseat of the car, to blend in with the upholstery. I didn’t want anyone to look at our company car and certainly not at me. Embarrassed to be the new kid, I slunk down so low all anyone could see of me from the street was from my nose up. I had questions, so many unanswered questions about my new school. Where were the bathrooms? Did they have water fountains? Was there a mid-morning snack? What would I do during recess if I didn’t know anyone? Would the students be farther along in their studies than my sixth-grade class in Orange? Would I be able to keep up? How much Spanish would I need to learn? Mother had my report card from Orange in case the new school needed proof that I was indeed in the sixth grade. Mrs. Mathews, my Orange teacher, had included my achievement scores and I.Q. results inside a sealed envelope. No chance to sneak a peek at anything. When we got out of the car, I tried to look shorter by lowering my head, a tall girl trick. In reality, it doesn’t make anyone look shorter, just submissive. I followed Mother like a puppy being dragged by an invisible leash. The Escuela Bella Vista office was cool thanks to the air conditioning unit humming in the window. A secretary at a typewriter looked up. I was scared to death she wouldn’t speak English. The three of us, Mother, Daddy and I, collectively spoke a total of five words of Spanish, and none of them had anything to do with school registration. She spoke English with an accent, but it was English. I sighed in relief. Mother explained that I was to register for school. Instead of whipping out a registration form, the secretary disappeared into another office without a word. Daddy stood to one side to see around taller Mother. She lit a cigarette and dropped her match into the empty ashtray on the counter. Daddy jingled some change from hand to hand. We waited in three-part silence. A man erupted through the door marked “Principal.” He threw the door open so hard it banged against the wall. I nearly laughed out loud when I saw him. He wore a bow tie. I thought only sissies wore bow ties. Either that or rather odd men on television like Mr. Peepers. I didn’t know which was funniest: the bow tie, his Coke bottle-thick horn-rimmed glasses or the saddle oxfords. I dared not laugh out loud. What kind of school was this anyway? Then he started talking fast, really fast. He announced he was the principal of the school, and we needed to fill out this form and that form, and what grade was I in. There was no casual, mannerly conversation like back home. No “How are you folks?” No “Where did you come from?” No “Who do you work for?” No pleasantries at all. Dear lord. This man was a Yankee. I tried to shrink a little lower. Mother tried to engage the sissy principal in everyday conversation. He only answered what she asked and offered nothing more. So, he was both rude and abrupt. Mother, who had a schoolteachers’ handwriting, picked up the office ballpoint pen, tapped the ash off her cigarette and filled in the forms as instructed. “Does Susan require any special considerations?” he asked in Mother’s direction. Like what? Did I stutter? Was I retarded? Did I have falling down fits? “Well, no,” Mother said, “except that she’s lazy.” Mother waved her cigarette in the air and followed with one of her ha, ha, ha choruses. Mr. Yankee Bowtie didn’t laugh or even smile. He stared at Mother through his Buddy Holly glasses. No expression. Just stared. He didn’t ask her if she would mind, could he impose on her kindness or any other polite way to speak to her. “Susan, do you remember how to get back home for lunch?” Mother asked me for the hundredth time that day. There was no cafeteria at my new school, which meant I would have to walk home for lunch. The Maracaibo school allowed a full hour and forty-five minutes for lunch, an unheard of length of time in the States. That was to allow time for a siesta. A nap during a school day? I hadn’t taken a nap since I was three years old. In Orange, we had a half hour for our school lunch. The public school lunches included culinary delights such as turnip greens, pinto beans, and canned fruit cocktail. On Fridays we always had baked-to-death, tasteless fish sticks. The ability to buy ice cream in the afternoon was all that saved that day of the week. “Yes, ma’am. I remember,” I muttered as I nodded. I shuffled off behind the secretary. My shoulders sagged. There were classrooms in an older section of the school separated by a breezeway from a more modern section. Instead of either section, the secretary led me through the breezeway. We walked on a long sidewalk across a large open yard to a much older building, an old building all alone. Later I called that an example of British Abroad architecture: high roof apex to accommodate the interior heat, extended eaves to block out the sun or blowing rain, and wooden shutters over windows with no screens. “What is your name?” the secretary asked in her heavy Spanish accent. I answered and she nodded. We had nothing else to say to each other. The secretary wore a sleeveless blouse and a full skirt. She had on low heels, and, horrors, no hose. How could any grown-up lady wear heels, even low heels, without nylon stockings? She walked as if she weren’t accustomed to wearing heels. Clump, clump, clump. The hot, morning, Maracaibo sun prickled my pale, November skin. I could not slump my shoulders down any further. I already looked like the Hunch Back of Notre Dame. The silent secretary and I climbed the few steps to my new classroom where she left me in the doorway. I had read somewhere that it was important to look friendly when you met people for the first time. I put my teeth together and stretched my lips into a toothy smile. No doubt my fake grin looked like a cross between a rigor mortis grimace and Alfred E. Neuman’s “What-me-worry?” smile. In spite of the fact I wanted to appear shorter, I straightened up to my full five-feet, six-inch, eleven-year-old stature and stepped inside the classroom doorway. I was sun blind as I entered the darker classroom. It felt cooler inside, not like air conditioning but cooler. While my eyes adjusted, I heard the whirr of several ceiling fans overhead. I could see down. My classroom floor was red, a deep red tile like the color of Mother’s homemade, pickled beets. That was not the usual green-gray schoolroom linoleum we had in the States. When my eyes finally adjusted, I saw there were at least thirty sets of student eyes looking at me. Why had I decided to stand up straight? She did not look like any teacher I’d had so far. Miss Kelley was young, and pretty in her white, sleeveless blouse, and green, printed cotton skirt. Her sandals did not require nylons. Miss Kelley was a “miss.” Not married. My Orange teachers were married, had gray hair pulled back into buns, and wore old-lady, lace-up, black corrective shoes. They all bordered on full-fledged battle-axe-dom. She said “please” to me? A teacher saying please to a student? My teachers had barked out orders like soldiers in World War II movies. But never please. “And where do you come from, please?” she asked. Another please. I answered her questions while I stood in front of the class. All the while I wished for the safety of a desk. Mercifully, Miss Kelley seated me at a desk in the back of the room. No doubt because none of other students were tall enough to see over me. Each student introduced him- or herself. They included such things as where they were originally from. Most were from Texas, Louisiana, or Oklahoma. Some mentioned the company their fathers worked for. Others told me which oil camp they lived in. “Susan, where do you live?” Miss Kelley asked. My face grew warm. I realized, in horror, that I did not know my own address. I didn’t even know the name of our street. No one laughed, or gawked, or rolled their eyes when I made it clear I didn’t know my own address. No one seemed surprised. “Are you going to move to Hotel del Lago?” someone asked. Not a minute too soon, it was time for arithmetic. I imagined I blushed six shades of red. I had no pencil or paper. Miss Kelley must have guessed what went through my mind. The school provided paper, and pencils for the students? Now, that was a deal. I exhaled my relief. I thanked Rita for my sheet of paper and a sharpened, number two pencil. I had sailed over the hurdle of no supplies with flying colors. I finished my arithmetic early with no difficulty. At least I was not behind in math. I studied my new classroom and my new classmates. The students looked and sounded different, indeed, from my classmates back home. An English kid sat near me. I’d never met anyone with a British accent. Then there were the Spanish-speaking girls. They all whispered among themselves in rapid-fire Spanish. One of the girls in particular was, well, dark. She wasn’t as dark as the colored people in Orange, but she was definitely dark. Her hair wasn’t frizzy, her lips weren’t thick, and her nose wasn’t broad. I couldn’t tell if she was colored or not. One night in Orange while I was supposed to be asleep, I heard Mother and Daddy talking about integration. I figured out from their conversation that it had to do with white and colored people going to school together. Mother assured Daddy that “some of them were OK.” I thought of the white line on the floor of the Greyhound and public buses and how the colored people had to sit behind that line. I never figured out why that was such a bad thing. Anyone could tell you the best seats, the very best seats, on any bus were the ones way in the back. There was supposed to be something bad about going to school with the colored kids, although I did not know what it was. Hadn’t we sung in Sunday school . . .
Wasn’t it written in the Bible that Jesus said, “Suffer the little children to come unto me?” So why was everyone so upset about going to school with a greater assortment of Jesus’ children? I decided since Daddy and, even Mother, seemed to be upset about the possibility of colored going to school with white kids in Orange, I’d better not say anything at home about that dark girl in my Maracaibo class. I saw no reason to make a big thing about it. I wasn’t even absolutely sure she was colored. Maybe she was Hawaiian, or Indian, or something else. I glanced around the room when I thought no one was looking at me. There were both boys’ and girls’ bathrooms at the back of the class, and I had noticed a water fountain outside the doorway to the left. The heat, even with the fans, was such that I felt sure I’d need frequent drinks. We did not have a mid-morning snack, but I decided I was too old for that anyway. A blue set of the World Book Encyclopedia, like the ones we had in the States, rested at waist level in the bookcase. Miss Kelley had a schedule of our classes posted on the wall. I was glad we’d have art and music classes later in the week. Spanish classes came after lunch, and something called Venezuelan social studies. I had no idea what that was, and I had no opportunity to ask. When the lunch bell rang, I dragged my feet to be one of the last at the classroom door so I would be close to the end of the line. If I had kids in front of me, I could follow them off the school grounds. Good. I’ve made it through a half day of class at my new school. Daddy had agreed to stay in Maracaibo for two years. I did not know how I was going to make it through the next one-year plus 364.5 more days. Everything was so different. I found my way to one of the open, pedestrian gates in front of the school and started my solitary walk home for lunch. Why did Mother and Daddy make me move there? I wanted to go home, not to our temporary home in Maracaibo. I wanted to go to Orange, where I belonged, where I had friends and everything was familiar. Well, at least no one had asked me if Pat McClurg was my older sister.